I'm going to have to say I don't think the world needed to know this. Anyone care about the state of the presidental poopy? Philippine President Gloria Macapagal-Arroyo left hospital on Saturday morning after being treated by doctors the whole Friday for her diarrhea-ralated upset stomach. Are you supposed to go to the hospital for that? Cause I usually just wait it out. 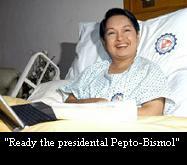 "She (Arroyo) is back to attending to the affairs of government," Health Secretary Francisco Duque told reporters. And running back and forth to the tiolet every ten minutes. Arroyo was originally planning to leave on Saturday for Spain to start her Europe trip. Nothing ruins a trip like a good ole fashion case of the squirts. I didn't know that what happen's to people everyday is such BIG news for some!